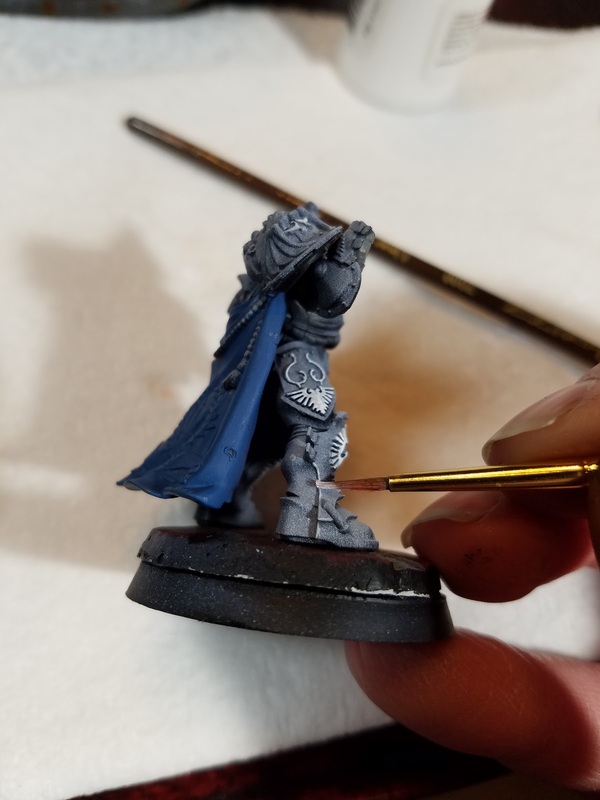 This is a by request tutorial from members of my own meta and in response to me running my mouth online and saying something about it's as easy as brush angle and the amount of paint on the brush. Painting raised filigree is a daunting task in many cases. It happens as a last step on a mostly painted model and has every potential of ruining your paintjob. It's very fine detail and unless you know what you're doing, it can make or break the model. Hvarl's red axe was nervewracking for me to put the final white touches on the cracks, but it made that blade. So lets begin. I have a mostly painted Custodes dude from the Burning of Prospero box that has lots of really pretty raised filigree that I'm going to tackle for this walkthrough. I'm using a medium sized brush. 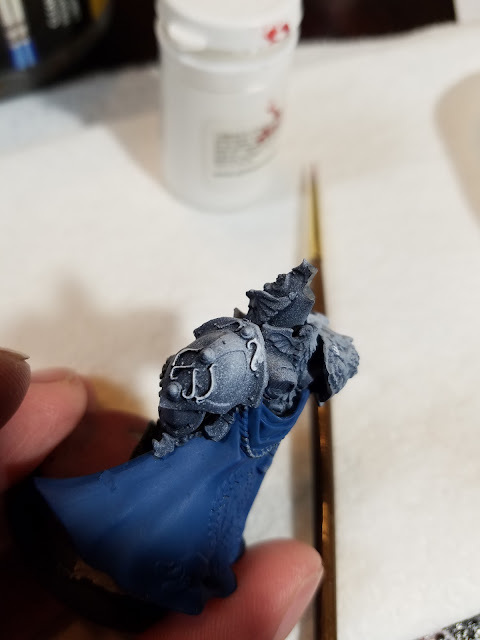 Less than a #2, but larger than the tiny detail brush from GW. I can paint this with a #2 though because this technique is Not about fine control with the tip. This technique focuses on the belly of the brush, the area between the tip and the base. This particular brand, Master's Touch from Hobby Lobby, like the curl within a few paintjobs, and have a slight curl at the tip. That actually works better for me in this case because it keeps the ends of the bristles up out of the rest of my model while I paint these raised edges, but it's not required. Here's the paints I'm using. I actually won't end up painting with the P3. The thing about your paint consistency is A) How much is on the brush and B) How dry it is. Regular model color isn't bad. P3 is a little too wet for this detail work in my opinion, and the Game Air is here for really bad examples. 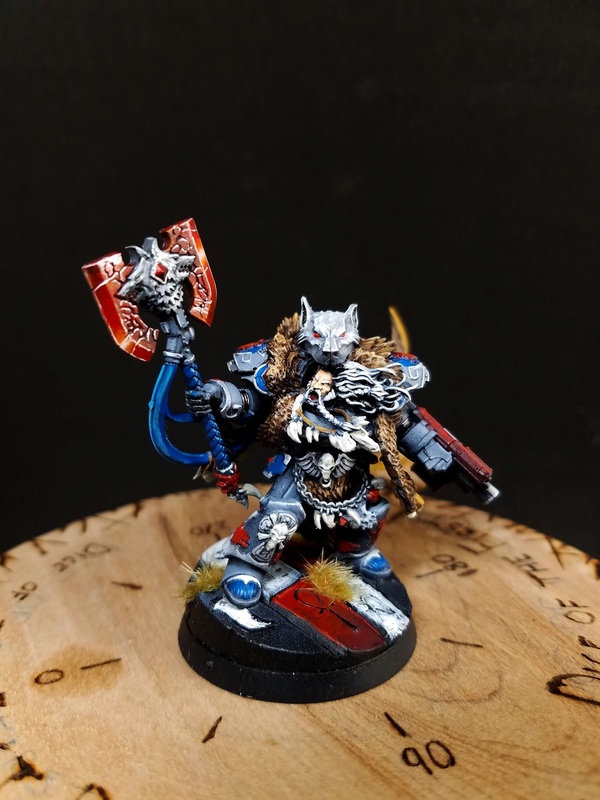 This is way too much paint. 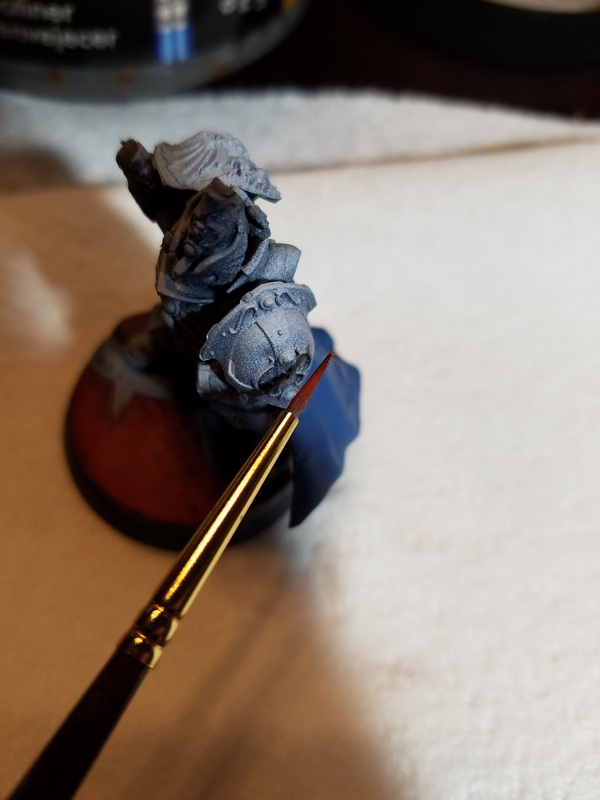 The motion used to do the painting is to lightly drag the belly of the brush across the model at a very shallow angle that keeps the tip up off the model. If the brush is overloaded in paint, it will slough off too much and pool and build up badly. Wipe some of this off on a paper towel. 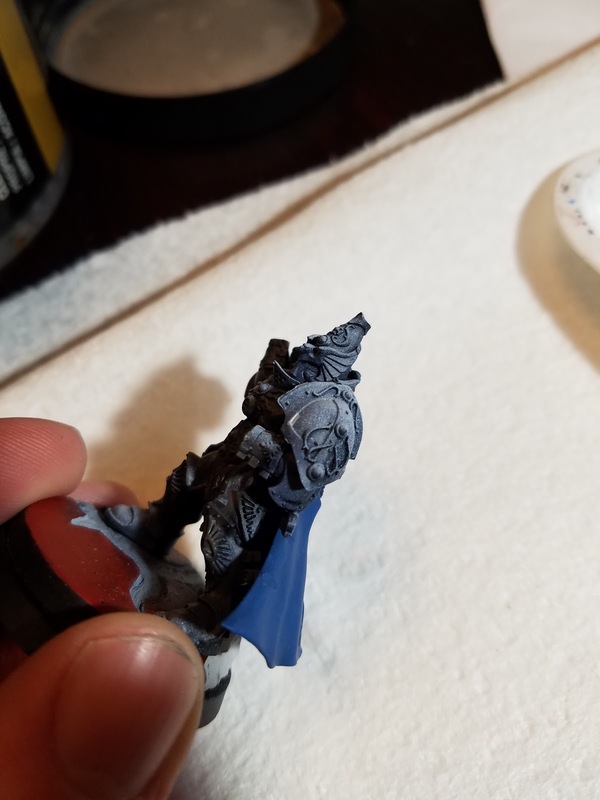 Not drybrush levels, but just to get the large glob off. My bristles split on me in this picture. I had to wet it down and reshape the brush, but that's the amount of paint that should be on the brush for this. 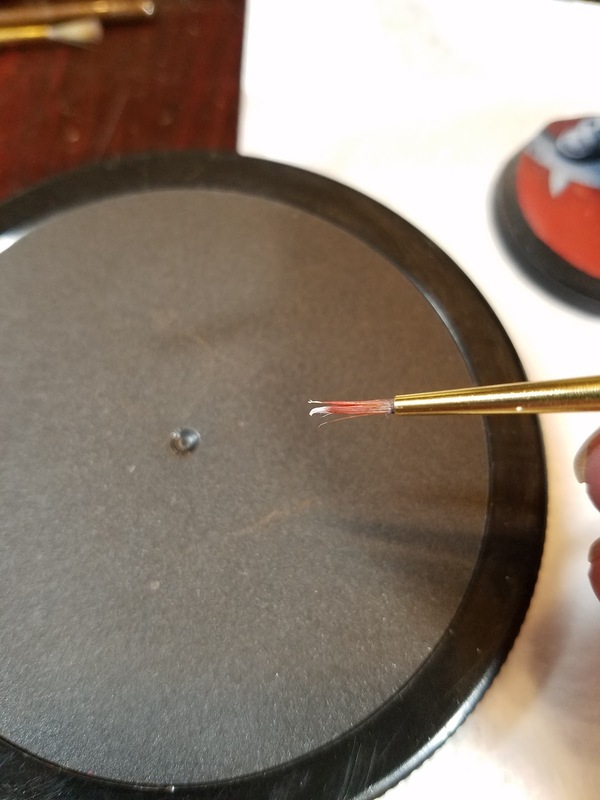 Note, that if you have to wet your brush to clean it, dry it thoroughly, or the water added to the paint will lower the surface tension of the paint and allow it to run down the edge of the filigree easy, causing problems I will demonstrate here shortly. Alright, so look at this picture. Nevermind the white mark on the left of the pad lol. 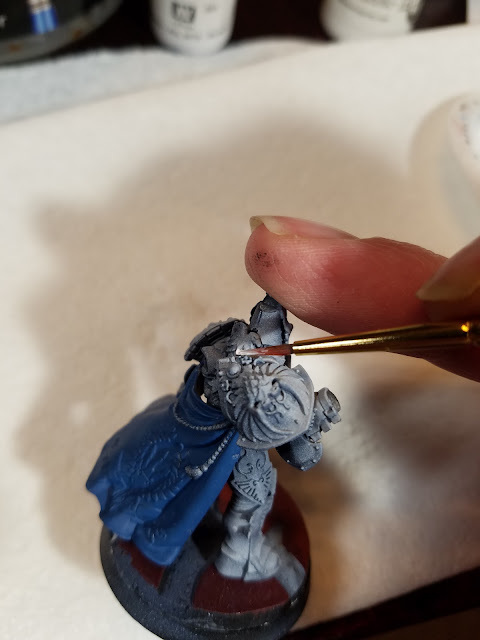 When doing this filigree, these raised edges, you're using the brush exactly like this. A very very shallow angle in relation to the model that keeps the tip up off the rest of the model. The direction of motion is extremely important as well. If, in this picture below, I move the brush up and down on the filigree, perpendicular to it's edges, I will scrape paint off the brush and build up paint on the filigree, losing the detail. 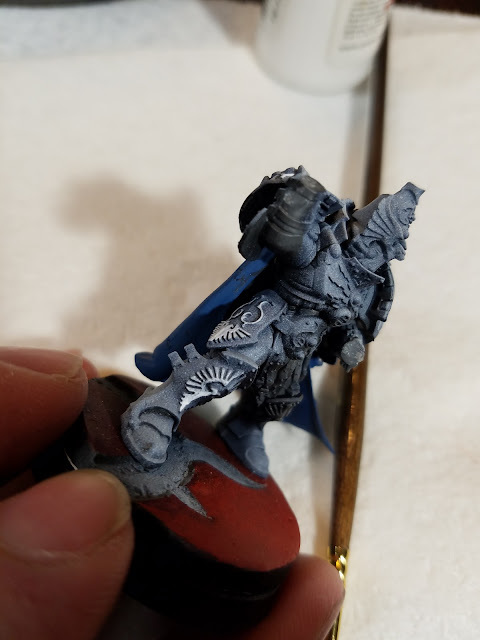 What I want to do is move the brush along the filigree, with my tip at and angle that can't reach the model. If the paint is too dry, it isn't going to come off of the brush. If it's too wet, it'll puddle. 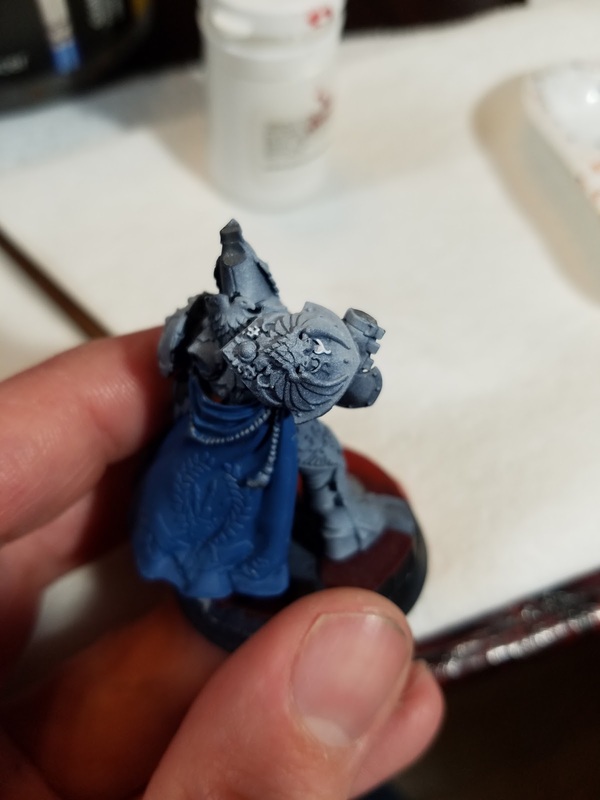 If there's too much paint, it will glob onto the model, and if there's too little, it won't do anything at all. Same technique, on an even smaller scale, hitting these little claw feet on the top. Keep the angle of the brush so that it does not encounter what ever is behind your detail. Why are we using the belly of the brush, you say? Because 99% of us do not have the fine control over the brush to use the tip. On top of that, as you work, the bristles can split or paint levels change and now you're all over the place. This is the safest, most efficient way to do this. Here is where I put too much paint on my brush and tried to run it against the filigree on the bottom of the pad, under the bird. You can see where it filled in that area in the middle because I had too much paint and it scraped off, filling that area. Too much paint. This is too wet of paint. 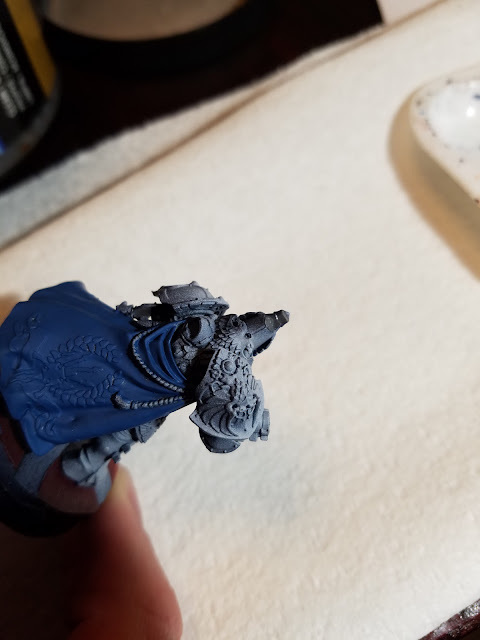 I switched to the Game Air for this demonstration, and you can see that it just began running off the filigree and all over the upper edge of the shoulder pad. The surface tension became too low with the moisture and just ran off. Here, I'm doing a large flat raised area, not just a fine filigree line. This is where brush direction has has to be very careful because you can slough off the edges and fill them with paint. Take this in layers. There's more area, so you don't need as much paint. Hit it a couple of times to build it up. 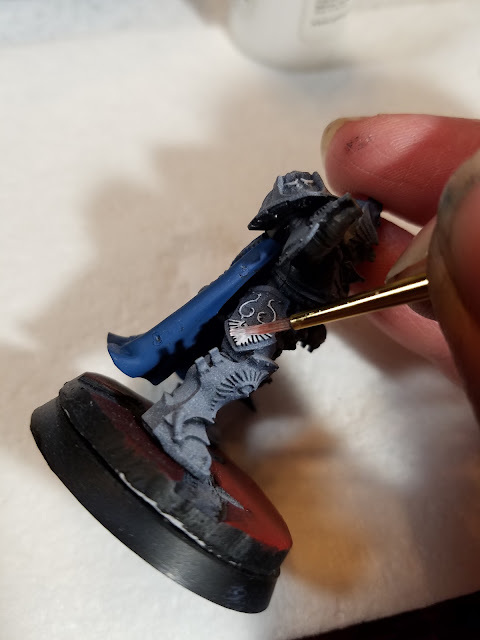 Use the belly of the brush and try to run with the edges as much as possible, exactly the opposite of drybrushing. Because this is what Drybrushing looks like on the right knee here. Inconsistent, just scratches, and there's paint in the recesses in the middle that got scraped off too. 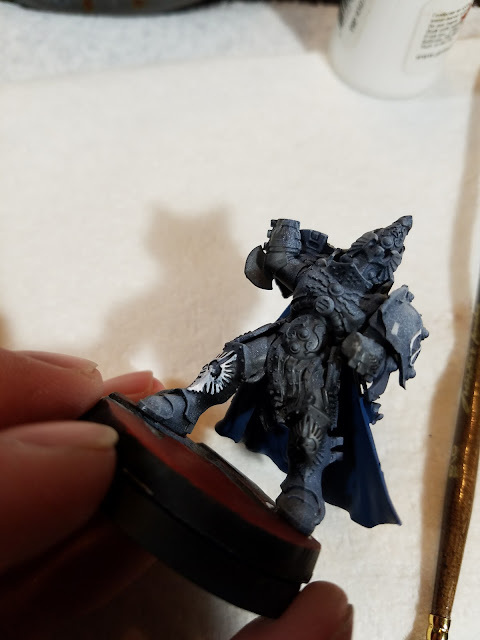 You can't see it as well but there's paint around the logo that the drybrush left as well. 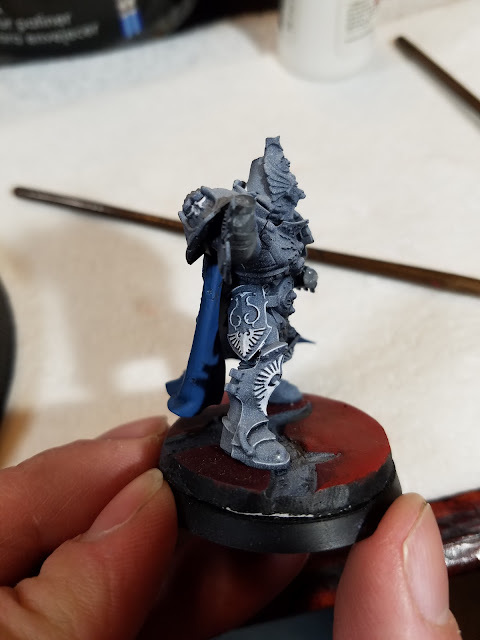 For new painters, dry brushing probably works ok, but if you want a cleanly finished looking model, drybrushing largely goes away. Just painting more detail here. Here, my paint is a little too wet. Not bad, but it's not covering super well so I let it dry and hit it with another layer. You can see though, that about the middle in that detail, some of the detail is lost because I let the paint get too wet and it basically became a wash and filled in some of those gaps in the wings logo. This technique works excellent for edging, as well. Tada. One great looking set of filigree and edges, done. 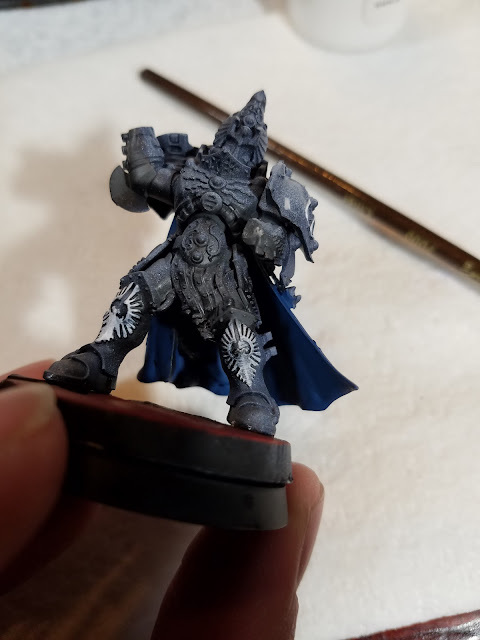 This is not actually how I'm going to paint this model, I'll use silver, but for this tutorial, I wanted something that would stand out a bit more. That's really cleaned up those edges, popped everything, and was not drybrushed. So none of the scraping patterns across the side anything. All clean egdes and filigree. 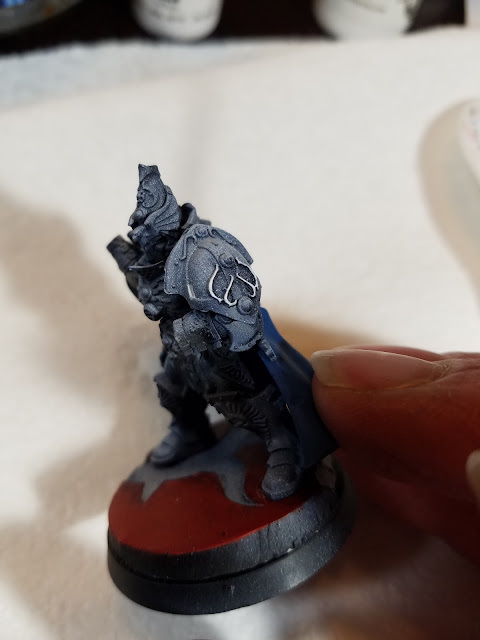 You can use this same technique to highlight these areas, and/or shade them. 1. 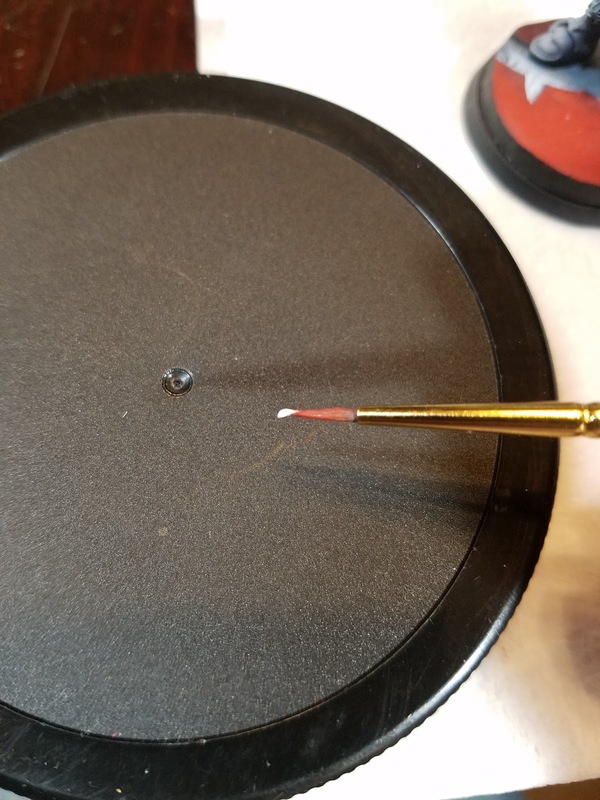 Brush size matters less than you think. Small brush does not equal better control. 2. Do not use the tip. The control is much less out there and every vibration in your hand is felt there. 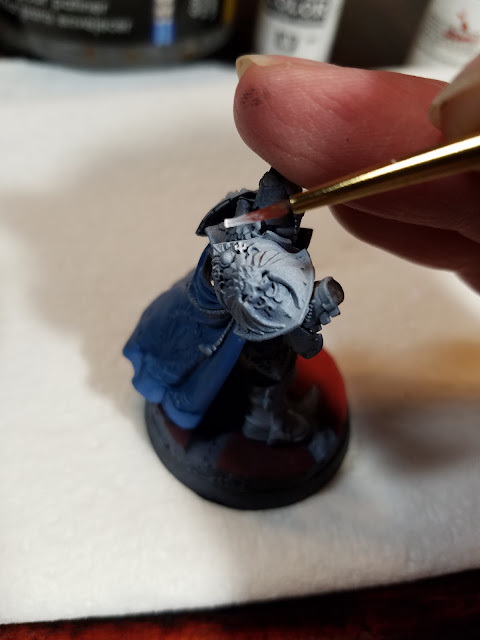 Use the belly of the brush, where a tip error won't ruin everything around it. 3. Pay attention to the motion direction of the brush. Do the opposite direction you would of Drybrushing. 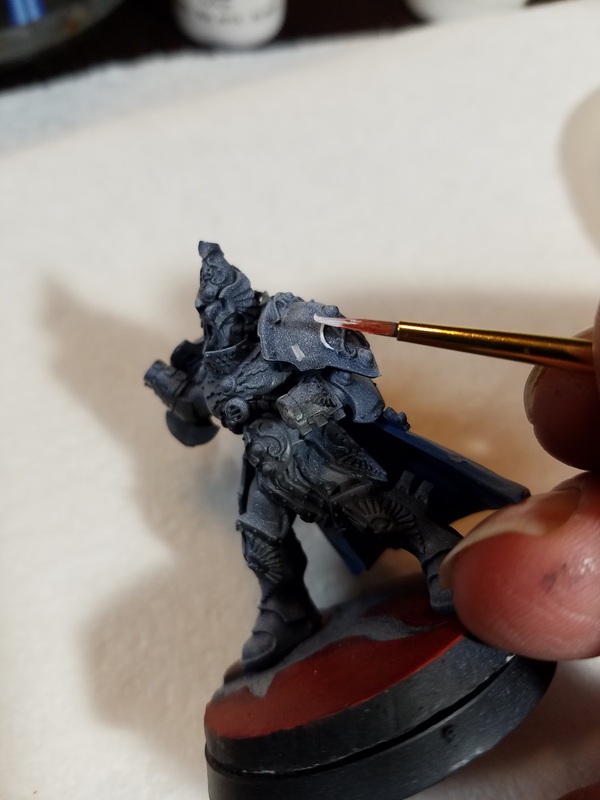 Drybrushing WANTS to scrape paint off of the brush, this technique does not. Move with the edges, not against them. 4. Paint consistency. Thicker paint drybrushes well, but may need slightly watered down here. Be careful with that though because again, if your surface tension gets too low the paint will spill around like a wash.
5. Paint amount. Dip lightly, rub the large globs off on a paper towel. The paint you're using will come from inside the brush. 6. Pay attention to your paint consistency throughout the session. This varies for every brand, paint age, and paint color. 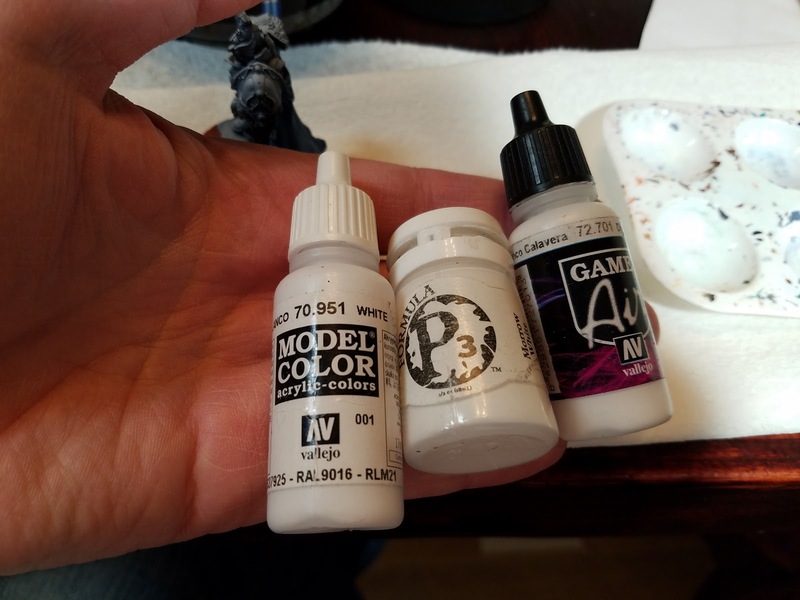 White gets very dry quicker, and chalkier than some of the darker pigments. If it's in a pot, this is less of a concern, but pay attention. Sometimes, I want it dryer, so I'll let it set for a few minutes before painting. Hopefully this has helped and pointed you in the right direction. Feel free to leave any comments or questions or insults.